If you are an iOS fan and enjoy interactive reading in the fantasy genre then you may like the Gamebook Adventures Series, and now the next instalment, Gamebook Adventures 6: The Wizard from Tarnath Tor has been released. The good thing with this latest app for iOS devices is the user doesn’t need to read previous gamebooks in order to play and enjoy Gamebook Adventures 6, an app that puts the user in control of the story with a realistic dice orientated battle system. The Gamebook Adventures 6: The Wizard from Tarnath Tor app for the iPhone, iPod Touch and Apple iPad enables the user to dictate the direction of the story based on where you go, what you find and who you meet and along your way fend off attacks from magical creatures from a mirror world and protective gryffons, barter your way past a goblin king, or become an accessory for an alchemist’s experiment. The Gamebook Adventures 6: The Wizard from Tarnath Tor app features 3 levels of difficulty, Classic, Bookworm and Novice, with artwork to find and achievements to collect and a unique 3D dice battle system that you roll by shaking the iDevice. 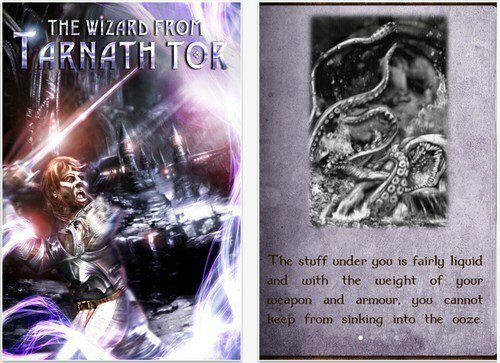 The Gamebook Adventures 6: The Wizard from Tarnath Tor app for the Apple iPad, iPod Touch and iPhone running iOS 3.1.3 or above is available to download from iTunes at a cost of $2.99.